Talented - Poet Sophie Green. 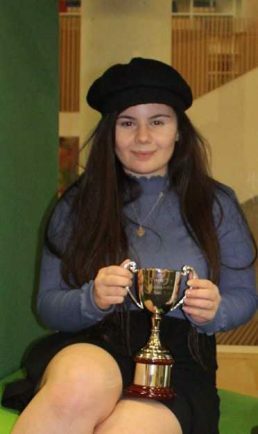 REDDITCH student Sophie Green has proved she is made of ‘the write stuff’ after being named Worcestershire’s 2019 Young Poet Laureate. Sophie, who was also a finalist in 2017, won the competition with her poems ‘There Is No Filthy To This’ and ‘Manchester’. She was congratulated by Worcestershire County Councillor Lucy Hodgson who said it was one of the closely contested competitions there had ever been. The runners-up were Catherine Darwen, 19, who also attends the University of Worcester and Cat Jones from St John’s in Worcester. The judges included outgoing Young Poet Laureate Connor Evans, Birmingham Poet Laureate (2017-18) Matt Windle and Carol Brown from Worcestershire County Council’s Library and Learning Services. As the winner of Word Up!, Sophie will now be tasked with writing and performing five commissions to a variety of audiences as well as inspiring people, particularly young people, to read and write poetry.